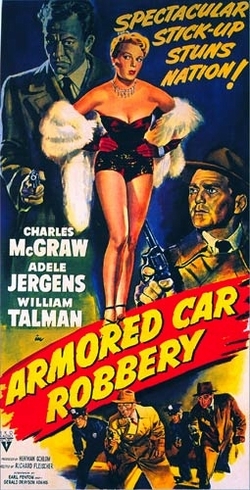 ARMORED CAR ROBBERY is definitely my kind of movie, a fast-paced 67-minute "B" noir from RKO, filmed on location around Los Angeles. William Talman (PERRY MASON) plays Dave Purvis, leader of a gang (Steve Brodie, Douglas Fowley, and Gene Evans) who knock over an armored car outside L.A.'s Wrigley Field. Purvis had previously clocked police response times to the ballpark, but he hadn't counted on a car with Lt. Jim Cordell (Charles McGraw) and his partner Lt. Philips (James Flavin) being in the vicinity when the call goes out. A gun battle ensues which seriously wounds one of the Purvis gang and kills Lt. Philips. The robbers make a getaway, and it's up to the grieving Lt. Cordell and rookie Detective Danny Ryan (Don McGuire) to track them down. 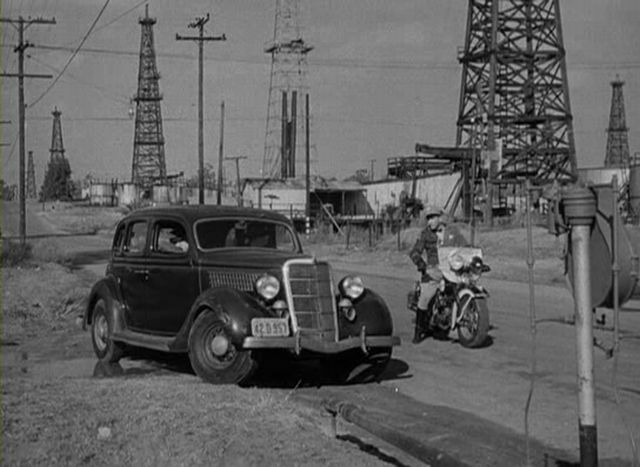 This movie has pretty much everything I love about a "B" noir, especially great location shooting around the L.A. area, including an oil field and Wrigley Field. (Wrigley Field was also featured prominently in the same year's SOUTHSIDE 1-1000.) I especially loved the "CSI" scenes with Detective Marshall (Mack Williams) from the police lab, which called to mind the crime lab sequences from yet another 1950 noir, MYSTERY STREET. The cast is terrific. 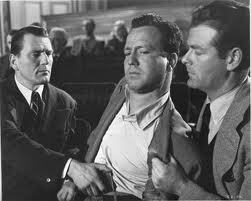 The only thing better than Charles McGraw as a bad guy is Charles McGraw as a good guy! He has a nice rapport with the green young partner (McGuire) he takes on after the death of Lt. Philips. The scene where he speaks to Lt. Philips' widow (Anne Nagel), inarticulately acknowledging the depth of their mutual loss, is one excellent scene among many. Don McGuire, who plays Detective Ryan, simultaneously had a career as a screenwriter. His credits included the story for DIAL 1119 (1950), released the same year as ARMORED CAR ROBBERY -- in fact, it's contained in the same DVD set -- and adapting BAD DAY AT BLACK ROCK (1955). He was nominated for the Oscar for the original story for TOOTSIE (1982). Adele Jergens is excellent in a Virginia Mayo-esque role as Purvis's flame Yvonne, a burlesque queen who happens to be married to another of the men involved in the robbery. While she looks quite stunning much of the time, flipping her platinum blonde hair and giving Purvis knowing looks, Jergens wasn't afraid to let the camera see a harder edge in some of her closeups; the stark black and white cinematography was by Guy Roe. Underneath the makeup and hairstyle, Yvonne has a cheap, rather "used" look. Jergens, incidentally, was married to actor Glenn Langan for four decades. Talman is excellent as the completely amoral "genius" behind the robbery, whose careful planning doesn't leave room for error. The depiction of his methods is interesting -- he even cuts the labels off his clothes in order that there will be as few traceable clues to his identity as possible. Talman's Purvis is quite scary when he has a gun in his hand as he demonstrates repeatedly he won't hesitate to use it. This being the era of the Production Code, it's no surprise that Purvis eventually gets what's coming to him, and it's a great moment of poetic justice. When Anne O'Neal turned up as a landlady, I couldn't immediately place her name, but I sure knew the face. I wonder how many landladies and maids she played throughout her career? The movie was directed by Richard Fleischer, director of other noir titles such as BODYGUARD (1948), FOLLOW ME QUIETLY (1949), and the classic THE NARROW MARGIN (1952), which also starred McGraw. The screenplay was cowritten by Gerald Drayson Adams, who also cowrote the recently seen FLAME OF ARABY (1951). 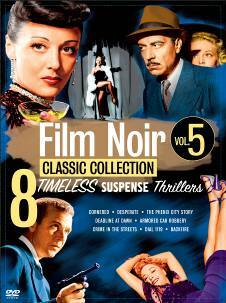 ARMORED CAR ROBBERY is available on DVD in the Film Noir Classic Collection, Volume 5. Other films in the set which have been reviewed here in the past are CORNERED (1945), DEADLINE AT DAWN (1946), DESPERATE (1947), and BACKFIRE (1950). May 2017 Update: This set has just been reissued by the Warner Archive. It's also had a release on Region 2 DVD in the UK. Fans of noir "B's" should love this one. Recommended. 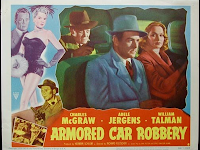 April 2018 Update: I had the wonderful opportunity to see ARMORED CAR ROBBERY in 35mm at the Noir City Film Festival. This sounds great. I love LA location shooting, too. 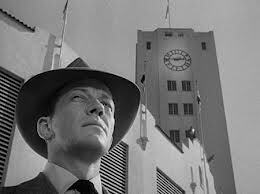 Gotta love a good "B" noir. Many thanks for excellent review and pictures. Such a good cast, led by the one and only McGraw. Also Douglas Fowley and Steve Brodie always good, and young Don McGuire had a nice style. This is one I watch again and again! 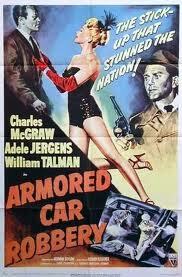 This really is one of the great noir thrillers and McGraw is terrific (but then, he always was) -thanks! I bet you'd really enjoy it, Jacqueline. Lots of interesting things to notice along with the story, such as the state of police technology (love watching the dispatch center!) and lab work. You're 100% right, Laurie. This is a great little movie.